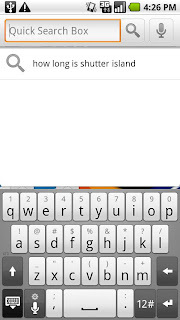 the htc ime keyboard has been ported to the motorola droid for those of you looking for another keyboard option. i’ve only been using it for about 10 minutes so i can necessarily give you a full review of my thoughts on it, but first impressions are very good. voice-to-text is included and it even gives you a little vibration or confirmation while pressing keys. the one drawback however is that this keyboard does not work in landscape mode. if you are a landscape touchscreen typer, then you’ll be out of luck. now, if you are like me and always pop the keyboard open for landscape, you are good! update 2/26 3:07pm: i just took her out for a spin and i’ve got to say that the voice-to-text works very well. in fact, i’m impressed with how nicely it works. typing on this keyboard is also very smooth and after whipping out an entire email with it, i doubt i’ll be going back to the stock droid keyboard any time soon. there are still rumors of bugs and i’d love to hear them as you run across any. enjoy! 2 apk’s are needed: htc_ime.apk for the keyboard and clicker.apk for the settings. install both.